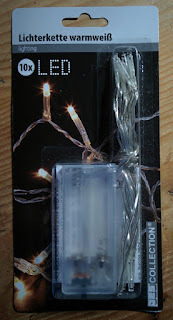 The idea came from the light-themed Budapest Makers' Meetup and from the cheap Christmas LED strip that my wife bought for about 1 euro. Plus my other hobby project has not gone as smoothly as expected but produced a connection-oriented nRF51822 code and bang, the idea was born, let's couple the LED strip with the Bluetooth Low Energy System-on-Chip (SoC), add an Android application and let's see what comes out of it. This post is the tale of that adventure. First, about the LED strip. 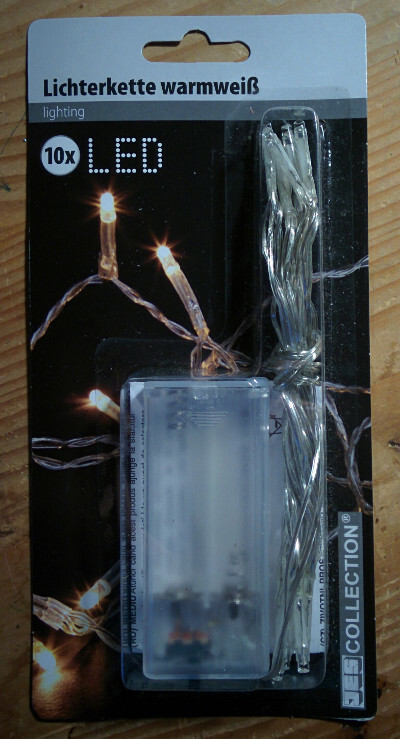 This is a battery-operated device with two states: off or on. It has surprisingly low power consumption considering its 10 LEDs. I removed the battery case and put it away - it will serve me well in other projects. 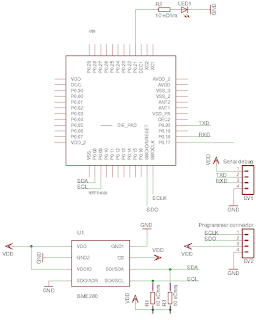 Then I hooked up the LED strip with the nRF51822 as shown in the schematics below (click to enlarge). 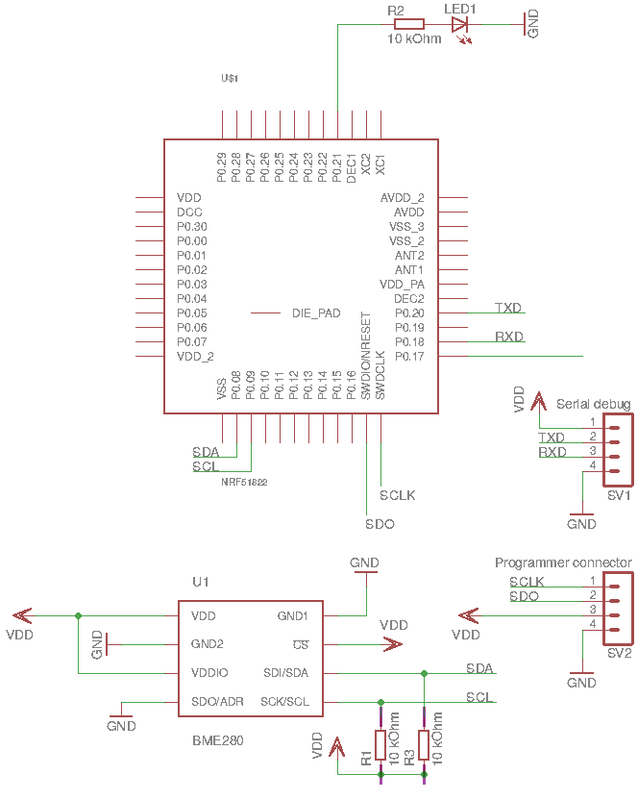 As described in some previous blog posts, I use a breakout board containing little more than a sole nRF51822 and the Bus Pirate programmer to upload the application into the chip. The components on the breakout board (quartz, etc.) are not shown in the schematics. If you use the same type of breakout board that I do, make sure that you connect both GNDs together otherwise instability may be the result. Other than that, the circuit is very simple. The LED strip is driven by P0.22 of the nRF51822. Even though the strip consumes in the mA range, I played safe and inserted a 2N7000 FET between the MCU and the LEDs. The 1 Ohm resistor was already part of the circuit in its original form so I thought it is a good idea to preserve it. One can also observe the 3.3V stabilizer circuit that transforms the POWER_INPUT (5V in my case) to the 3.3V consumed by the circuit. Any stabilizer circuit will do, I just point out that without the C1 condensator I experienced instability when the Bluetooth radio was in operation. The whole circuit sits nicely in a plastic electronic enclosure box. Now on to the software. 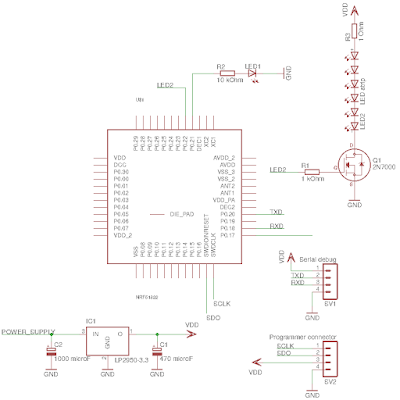 Click here to download the nRF51822 sources. Click here to download the Android sources. The programmer software that drives the Bus Pirate tool is the same forked version that we used before. The project assumes the 12.1.0 version of the nRF5 SDK. I propose that you stick to this version too because upgrading the project to another version may involve a lot of work (as I experienced previously). Convert the soft device with the convert_s130.sh script, upload into the device with the upload_softdevice.sh, compile the code with the "make" command then upload the application with the upload.sh. While doing this, you need to modify SDK path and device files in the scripts/Makefile according to the directory layout of your system. After a power cycle, you can observe the device spitting out a large amount of debug messages on the debug serial port. Also, LED1 starts flashing showing BLE advertising activity. Write the following byte array into the characteristic with the UUID of 274b0000-b9cd-4e5e-94c4-1248b42b82f8. This means 3 seconds ramp-up to 0x60 intensity (96%), no flashing, 3 seconds ramp-down from 0x60 intensity. If you see this light effect, the device is ready. Don't forget to disconnect: the application can handle only one active connection and there's no timeout mechanism implemented. The BLE device implements the following light effect. First there is the ramp-up phase when the light intensity increases from 0 to a maximum. The ramp-up time and the maximum intensity can be set by means of BLE. Then there is the flashing phase when two states with different intensity come one after the other. The repetition counter, the length and the intensity of both states can be set. Then there is the ramp-down phase, when the intensity goes down from a maximum to zero. Here again the ramp-down time and the initial intensity can be set. All these phases are optional, if any of the time value is zero, that phase is skipped, if the repetition counter is zero then the flashing phase is skipped entirely. The LED strip is capable of only on and off states hence the intensity effect is implemented by means of pulse-width modulation (PWM). The BLE application operates a 100 msec timer that updates the timeouts, intensity changes and state transitions. Look for the light_update_timer_handler function in main.c if you want to modify that functionality. 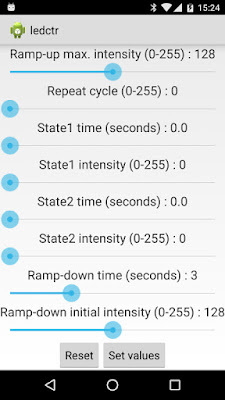 In order to create the Android project, follow the instructions in this blog post. Essentially you have to create an empty Android Studio project then replace the source tree under app/src with the content of the ZIP file that you downloaded previously. The Android application has two major parts. First, it scans for BLE devices that advertise that unique UUID that I allocated to the application and lists those devices in a List. 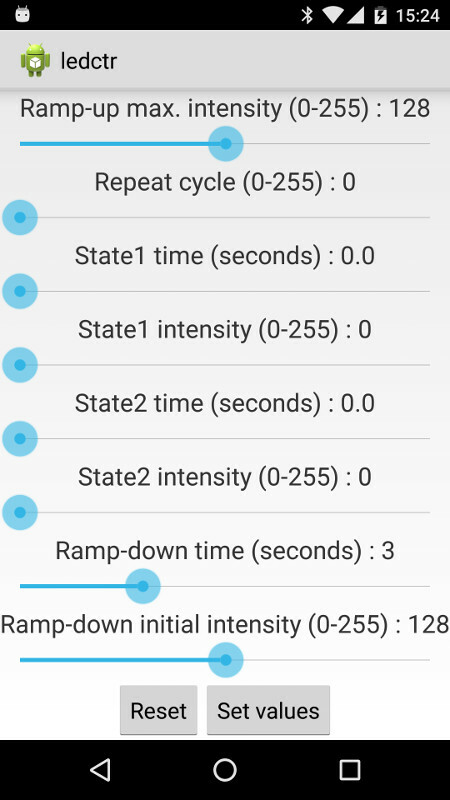 If the user clicks any of the devices, the Android application connects to the LED controller service with the unique UUID I mentioned before, retrieves the current state of the light effects and displays it by means of some SeekBars. The user can manipulate these parameters then update them on the device by pushing the "Set values" button. The device then starts to perform the light effect. The user can disconnect by pushing the "back" button. The other problematic part is the lack of security. Anyone knowing how to connect to the device (either by knowing the format of the light effect blob or by just simply having the Android application installed) can manipulate the light effect. Personally I don't think it is a major issue because security can always be added later. Beside, what could possibly go wrong if a passersby can just change the light effect in my window? 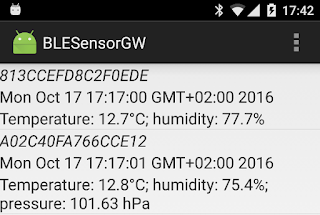 The previous two posts introduced a BLE-enabled weather sensor (temperature and humidity) and the Android application that extracts data from this sensor. I hinted that I intend to proceed with a more sophisticated sensor, Bosch Sensortech's BME280 but other projects diverted my attention (shameless self-promotion: read this paper about microcontrollers, image processing and low-power wide area networks if you are curious, what kind of projects took my time). 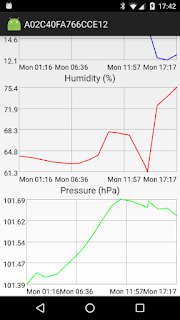 But I never forgot my BME280 temperature/humidity/pressure sensors sitting in my drawer and once I had a bit of time, I resurrected the project. The idea is the same as with the DHT-22. The nRF51822 combined ARM Cortex-M0 microcontroller/Bluetooth Low Energy radio unit will make the sensor data available over Bluetooth Low Energy (BLE) access. The smartphone will read this data and display it to the user. Later (not in this post) I intend to upload the data into some web service for analysis. We have already done this with the DHT-22, now we extend the sensor range with the BME280. Click here to download the Android application. 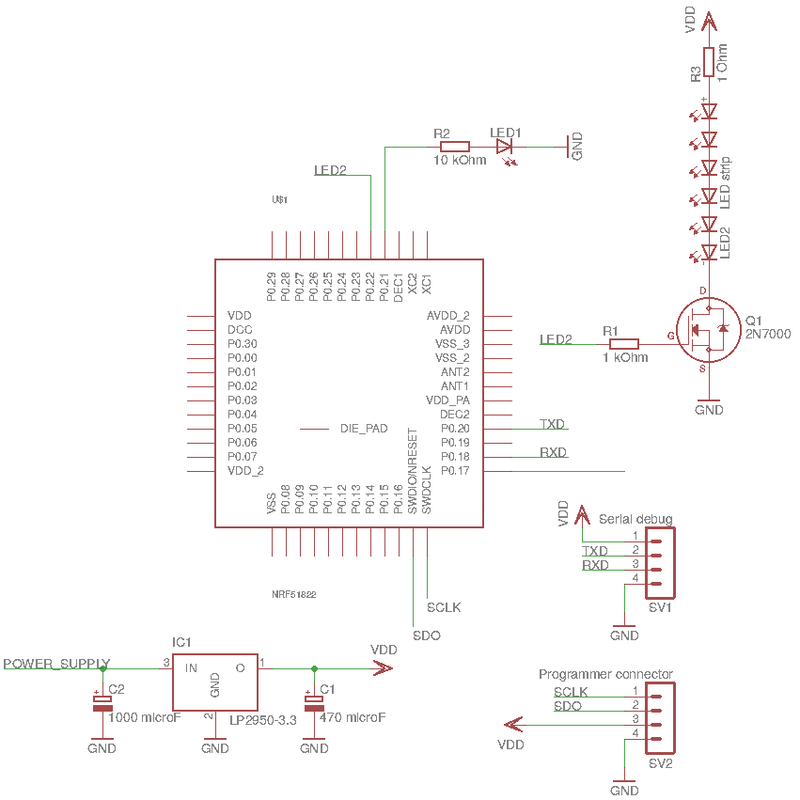 Click here to download the nRF51822 projects that are running on the sensor hardware. Let's start with the sensor. Below is the schematic for the hardware (click to enlarge). The difference between this and the previous one is that the DHT-22 was connected to a simple GPIO pin while the BME280 uses the more sophisticated I2C bus. As the BME280 is quite miniature, I used a breakout board for the sensor too. LED1 and the serial debug port are optional (but quite useful). Debug messages are emitted to the serial port, you need a 3.3V-to-RS232 converter on the TxD pin if you want to observe those. 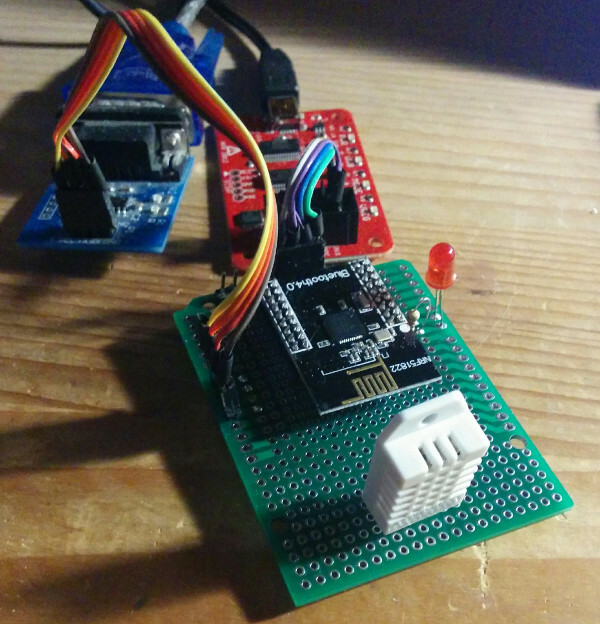 As described previously, the circuit is realized with a low-cost nRF51822 breakout board and is programmed with the Bus Pirate programmer, adapted to nRF51822 by Florian Echtler. The only thing I changed in this setup is that this time I moved the projects to the latest version of the SDK which is the 12.1.0. Also, the soft device (the program module implementing the BLE stack) was bumped from S100 to S130. These decisions caused quite a headache because there's significant difference between the old SDK and the 12.1.0. Therefore I decided that in the nRF51822 project file I share not only the sensor project (called adv_bme180) but two simpler ones (blinky_new and blinky_new_s130) as additions to the instructions on Florian's page. As a recap: the soft device need to be flashed into the device before any BLE application is flashed and the starting address of the BLE application depends on the size of the soft device. This has changed between S100 and S130, hence the updated projects. In both blinky_new_s130 and adv_bme280 you will find the convert_s130.sh and upload_softdevice.sh scripts that convert into binary format and flash the S130 soft device that came with the Nordic SDK. Once you uploaded the S130 soft device, compile the project in adv_bme180 and upload it into the nRF51822. The sensor node works the same way as the DHT-22 version. The MCU in the nRF51822 acquires measurements from the BME280 by means of the I2C bus (called Two-Wire Interface, TWI in the nRF51822 documentation), once in every second. This includes temperature, humidity and pressure. Then the measurement values are compensated by the read-only calibration data also stored in the BME280 that the MCU reads in the initialization phase. The BME280_compensate_T, BME280_compensate_P and bme280_compensate_H functions come from the BME280 user's manual. The result is the compensated temperature, humidity and pressure values that the MCU puts into the BLE advertisement data. The advertisement data also contains the nRF51822's unique ID that is used to identify the sensor. 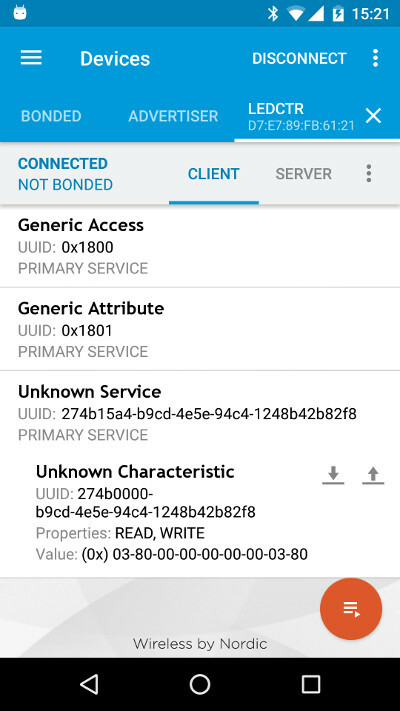 The sensor has no name as the measurement+ID data is now too long to allow sensor name info too, BLE readers now recognize the sensor purely by its unique UUID. Now on to the Android part. The architecture of the application is pretty much the same as described in the previous post. Creating an Android Studio project works the same way as described there: create an empty Android Studio project, write over the app/src/main subtree with the content of the archive that you downloaded from this post and update app/build.gradle file with the GraphView dependency. The BME280 functionalty was inserted in three places. First, BME280 data has its own data provider (BME280SensorDataProvider.java). This new provider is able to handle pressure data that DHT-22 measurements don't have. BLESensorGWService properly recognizes BME280 sensor nodes beside the DHT-22 sensor nodes (so both are handled), parses BME280 advertisements and puts the measurement data into the BME280 data provider. MainActivity knows about the BME280 data provider, uses its data to create the sensor list and invokes BME280GraphMeasurementActivity if the sensor in question is BME280 sensor. 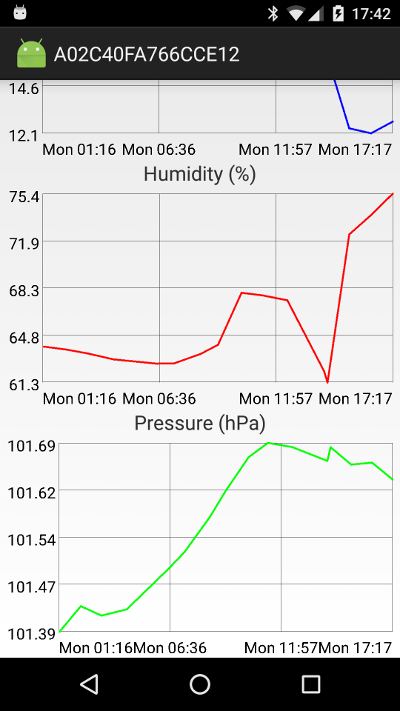 This new visualization activity has pressure graph too. This is how the sensor list looks like with a DHT-22 and a BME280 sensor (DHT-22 does not have pressure data, BME280 does). And this is how the pressure graph looks like in the BME280 visualization activity. And at last, some words about the deployment. I got a question, how the power supply works. After more than half a year of operation, I ended up with a discarded 12V motorcycle battery as power source. This battery used to have 6Ah capacity, now it has about half which is not enough to feed a motorcycle but is quite enough to yield 1-2 mA per sensor node for a long time. Also, this battery is designed to withstand quite severe weather conditions. I can only recommend discarded but still functional motorcycle/car batteries as power source if the place available for the sensor permits it. Here is how the BME280 sensor looks like in its protective plastic box. The small panel in the foreground is a cheap DC-DC converter (not shown in the schematics) which makes the step-down from 12V to 3.3V. 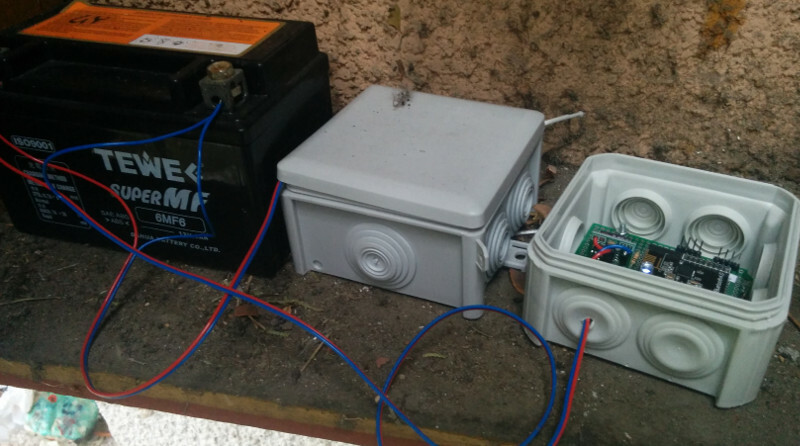 And here is how the sensor nodes sit in an outdoor box with the battery. The lid of the BME280 node is removed for demonstration, the other box contains the DHT-22 sensor. Now the part that is really missing is the data upload/data analysis functionality. 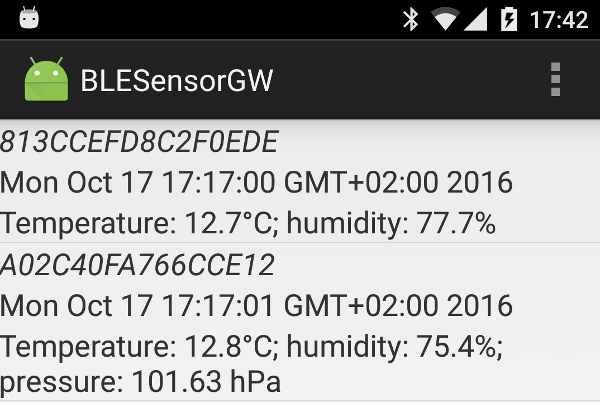 The previous post was about a low-cost Bluetooth Low Energy sensor (really, one sensor unit that includes the BLE-enabled microcontroller too costs less than 15 USD and that's just a single prototype, economies of scale come on top of that) and its accompanying Android app that allows obtaining sensor reading manually. That's not bad but manually reading data is sort of inconvenient. If you want to know, what the temperature and humidity was in the dawn, you have to be awake in that early hour. Personally, I prefer to sleep then so I decided to automate the whole process. The project depends on Jonas Gehring's GraphView project, hence this new dependency. Let's see the interesting bits of this app. First and foremost, it is an interesting feature of this application that the BLE layer is used in such a way that reading the sensor is not an extra cost for the sensor. As the measurement data is embedded into the advertisement packets that the device broadcasts anyway, it does not matter if 1 or 1000 phones read and store data. So this sort of sensor network can grow into an entire ecosystem - the more phone users install and use the app, the more precisely the measured quantity will be available once the phones upload their catch to the server. If you observe, how the data is stored (DHT22SensorDataProvider.java), you can recognize an important shortcut that I made: the database structure depends on the sensor being used. This provider depends on the fact that DHT-22 (the actual measurement device) provides temperature and humidity data in the same reading. A different sensor (like the Bosch BME280 sensors sitting in my drawer waiting for their turn) will require a new provider and also a modification of the visualization part. So there's significant development potential in making the app more flexible when it comes to adding a new sensor type. The actual sampling of the service happens in BLESensorGWService using the AlarmManager to trigger the scan. Now getting the device awake if it was just sleeping is not a simple business. Observe in the list below, that even though there's always an hourly reading, there's a significant variation when the reading happens. 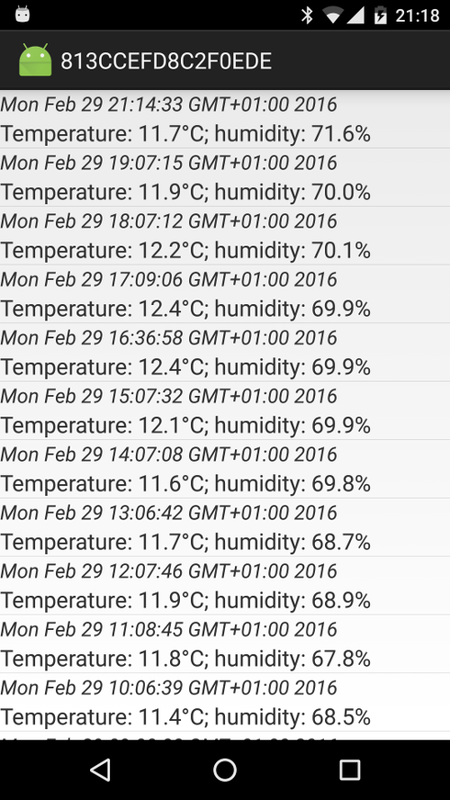 In case of our weather reading, it was not a problem but some sensors may have more variable data. A large number of devices reading and uploading would solve the problem of reading time variations. GraphMeasurementActivity is the activity that depends on Jonas Gehring's GraphView. The graphs are very simple so if you have another favourite graph view component, just replace it there. 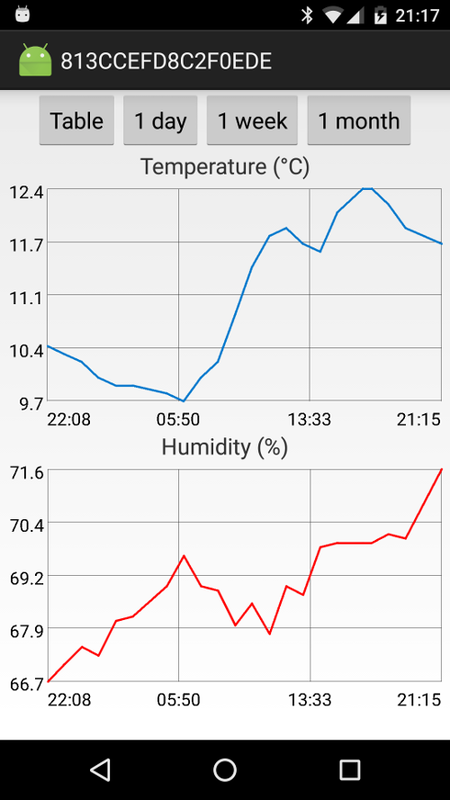 So we are at the point that we added sensors to our Android device using Bluetooth Low Energy and created an application that samples them producing nice weather-related data series. The next step will be the integration of a cloud-based data analysis. I am still thinking, which one to go for. 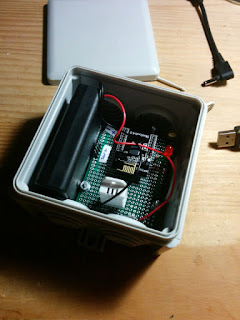 And finally, the picture of the sensor, in its "weather-resistant" box. 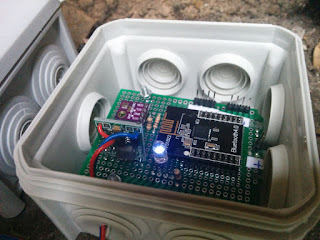 I built quite many prototypes on this blog with RFDuino based on Nordic Semiconductor's nRF51822 and I can still recommend that small development board to people who want to get initiated quickly and painlessly into the world of Bluetooth Low Energy programming. The limitations of RFDuino became apparent quite soon and it was time to get deeper. On the other hand, I wanted to stay with the excellent nRF51822 so I looked for a breakout board - as simple as possible. 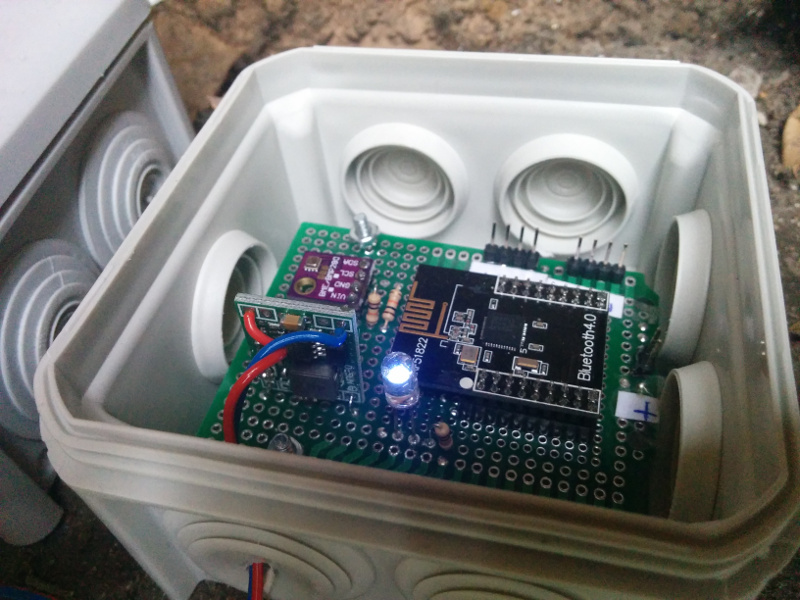 This is how I stumbled into Florian Echtler's page about low-cost BLE development environment based on the nRF51822 and the Bus Pirate programming tool. So I quickly ordered a no-name variant of Waveshare's Core51822 breakout board, a Bus Pirate tool and a bunch of DHT-22 sensors (because I wanted to measure something in the environment). Also note that the breakout board has a connector with 2 mm pin spacing which is not the usual 0.1 inch pitch. It helps if you have a prototyping board with both 2 mm and 0.1 inch pitch like this one which cannot be found in every store. Generally speaking, following the instructions on Florian's page was easy enough. I ran into two issues. First, I had no success with the SWD programming software he refers to but Florian's fork (which is based on an earlier version of the programming software) worked well for me. Second, I experienced instability if the GND pins of the breakout are not connected (there are 2 of them). First about the hardware. The schematic below show only the parts that are connected to the pins of the breakout board, the schematic of the breakout board itself is not included. DHT-22 is connected to P0.17 which is both input and output depending on the communication phase. P0.21 LED provides a feedback about the BLE activities. This is a convention coming from the PCA10028 dev board that we lied to the Nordic tool chain that we have. You can omit this LED if you want to save some energy. 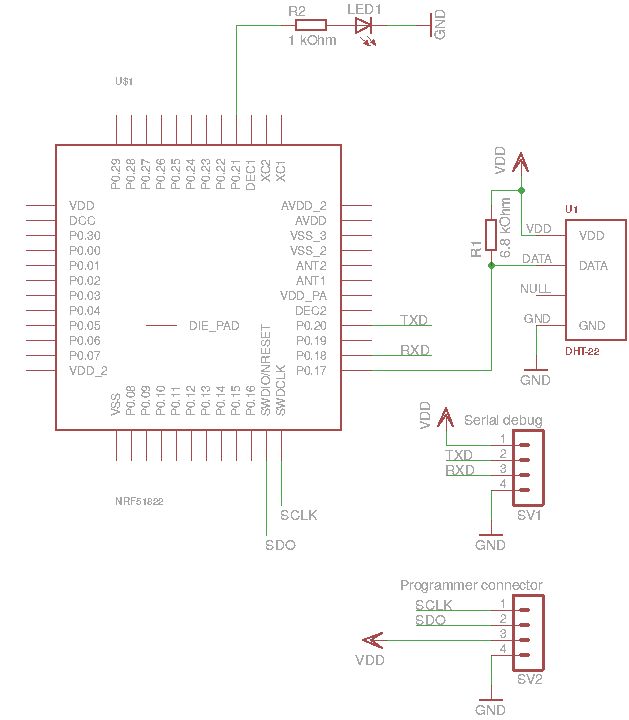 SV1 header is a TTL serial port where the example program emits some debug messages. You can omit this header if you are extremely confident. I use a level converter like this to connect this port to a standard RS232C port. The UART operates on P0.18 (RxD) and P0.20 (TxD). SV2 header goes to the Bus Pirate. Check out Florian's document about the connection. Make sure that this cable is as short as possible. Here is how the board looks in all its glory, the Bus Pirate and the RS232C level converter boards in the background. These are of course not needed for deployment, the board runs standalone after the testing is successful. Click here (adv_dht22.zip (nRF51822), bledht22.zip (Android)) to download the example programs related to this blog post. Edit Makefile and make sure that the RF51_SDK_PATH variable points to the location where you installed the Nordic SDK. Edit upload.sh and make sure that the paths point to the location where you installed Florian's version of the SWD programmer. Also, make sure that the USB device is correct (/dev/ttyUSB0 by default). Now you can say "make" and then "upload.sh". If all goes well, the code is installed in the nRF51822 and you get debug messages on the serial port. 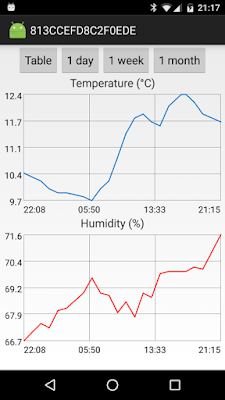 At this moment, the nRF51822 is already advertising the measurements it obtained from the DHT-22 sensor. You can check the content of the advertisements with this test tool. Check out in advertising_init(), how the advertisement packet is set up. We transfer the measurements in a service data GAP field and I took the liberty to allocate a 16-bit UUID for it (quite far from the standard service UUIDs). Check out timers_init(), timers_start() and sampler_timer_handler() methods how the periodic reading of the sensor and the update of the advertisement packet is accomplished. DHT-22 sensor handling is done in dht22.c. This sensor has a somewhat peculiar 1-wire interface. Read this document and the code will be easy to understand. Regarding the Android code: this is just the app/src part of the source tree of an Android Studio project. I adopted this rather primitive export method as this super-advanced IDE still does not have code export option that its obsolete predecessor, the Eclipse IDE used to have. Check out onLeScan method in MainActivity.java to see, how the BLE GAP parser introduced in this blog post is used to take apart the advertisement message and filter BLE nodes that advertise DHT-22 measurements. Note that each sensor is identified by a 64-bit unique ID (a service of the nRF51822). Now this data just needs to be uploaded into some sort of service and then the big data analysis can start ;-). More about that later. The three previous parts (here, here and here) of this series introduced the infrared-to-Android gateway. Even though those prototypes captured the signals of an ordinary IR remote, I already hinted that I was aiming for something more exciting. In this part, we will replace the IR remote with our own IR transmitter. Once we have our own IR transmitter, we will be able to transfer our own data over IR light. This data link is not reliable enough to transfer large amount of data but in lot of the cases that's not required. E.g. to transfer the data of a temperature/humidity sensor, 32 bit is more than enough. So what can we expect from IR-based data transfer with respect to more popular, radio-based transfer? There are advantages and disadvantages. Advantage for the IR solution is that it is extremely cheap and also extremely power-efficient. Advantage for radio is that IR-based solution always requires line of sight, while radio waves can - to some extent - traverse walls, etc. Advantage for radio is that the IR transmitter has to be aimed at the receiver, if for some reason the receiver and the transmitter move with respect to each other, they lose contact very easily. There's also the question of range. Ordinary TV remotes work up to 3-4 meters of distances which is nice for an inexpensive consumer device but is not enough even for indoor sensor network use cases. In this part I try to figure out what the distance limit may be. For starter, this question is not defined precisely. With sophisticated optics, high-powered transmitters and careful targeting, IR data transfer can be accomplished over significant distances. But we said that we are looking for cheap hardware so we can't rely on sophisticated devices. We need some sort of optics but this should be simple and cheap. That's why I went to a second-hand toy shop and bingo, I found the IR transmitter of Thinkway Toys' Lazer Stunt Chaser. 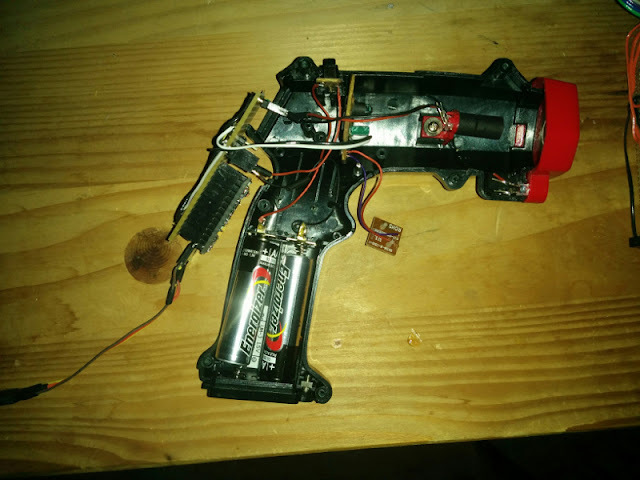 The small toy car has long been lost, but the handgun-like IR transmitter somehow made its way to Hungary. This cheap, plastic toy is a marvelous device. It promises 12 meters of effective range and even though the mounting of the IR light source and the plastic optics is made of cheap materials, it is surprisingly efficient. It even has a normal (red) LED emitting its light through the transparent housing of the infrared LED which produces visible red light circle of about 10 cm of diameter facilitating the targeting of the IR transmitter. The software works on any Atmel ATmega328p-based boards, e.g. 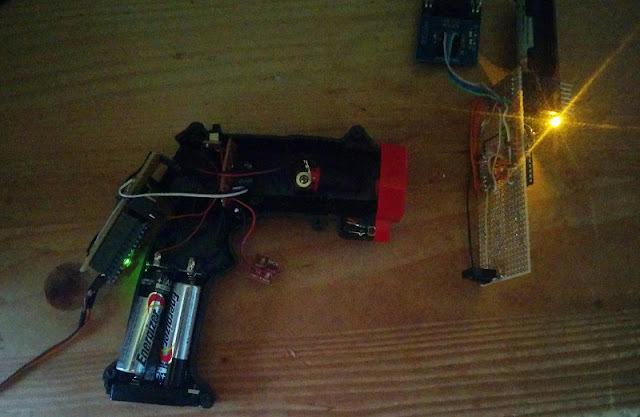 on Arduino Uno. If your MCU uses power source with higher voltage than 3.3V, adapt R2 accordingly. E.g. for an 5V Arduino Uno board, you need about 160 Ohm. So this is how I hacked my circuit into the IR transmitter. Note the two LEDs: the IR led in the tube-like mounting and the ordinary red LED behind it that is used for targeting. 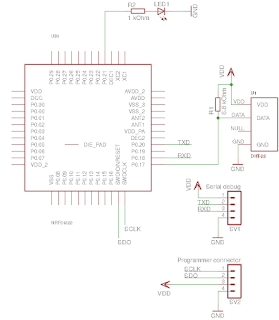 Also, note how the IR LED is connected to the ATmega328p's PD3 pin - IRLib which is the software used to construct the transmitter selects OC2B PWM output so the primary Timer2 PWM pin (PB3) would not work. Click here to download the source code of the IR transmitter. Open sketch/Makefile and update the ARDUINO_DIR according to your installation. Also, update ISP_PROG according to the programming tool you use to deploy the code. I used USBtinyISP, the Makefile is set accordingly. If your board has USB programming port (like the Arduino Uno has), then setting ISP_PROG is unnecessary. if you don't need a tool. About the code. The application emits a 32-bit NEC IR code every 4 seconds. The value of the code is increasing. The application is based on the same IRLib library as the receiver was, this time the only modification necessary was that I disabled all the receiver routines as this device does not receive any data. And that's my response to all the people worrying about the security of the Internet of Things: if the Thing is physically unable to receive any data then it cannot be hacked, period. Even though this application is not particularly energy-efficient, care was taken to implement the sleeping part with the lowest possible energy consumption. Hence the delay logic does not use the Arduino delay() function but puts the MCU into deep sleep and triggers the watchdog timer to launch a new iteration. Read Nick Gammon's excellent analysis of ATmega328p power saving techniques for further explanation. So what are my experiences? Using the infrared-to-Android gateway I presented previously which is based on a basic IR receiver circuit (TSOP1738) without any optics and the IR transmitter hacked into a Thinkway toy, which uses cheap plastic optics, I was able to transmit codes to a distance of about 10 meters (and then receive the code on the Android device over BLE). Of course, not every transmission was successful. My experience is that the code needs to be repeated about 5 times if you want to be nearly 100% sure that it arrives (100% can never be achieved). One important take-away is that the targeting LED in the Thinkway toy was not there by chance, in order to target the IR receiver, you really need that aid of visible red light circle. 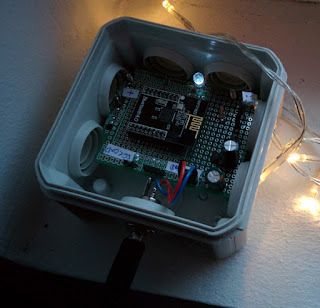 But that's about it: 2 LEDs, a cheap MCU and some optics and you can connect sensors from an entire room to one relatively expensive BLE unit. Also, these IR-connected sensors need very little energy. So it is worth considering the advantages/disadvantages. 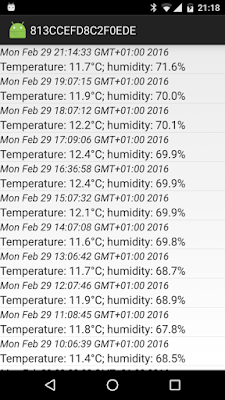 This blog is a personal diary about my adventures with the Google Android platform. I write it in the hope that others may find my experiences useful but please, beware. The blog is created as I gain experience about the platform myself so errors, omissions, etc. may be found in the entries. You may want to try out the example programs on this page. Start in this blog entry for a tutorial about command-line development for Android SDK.